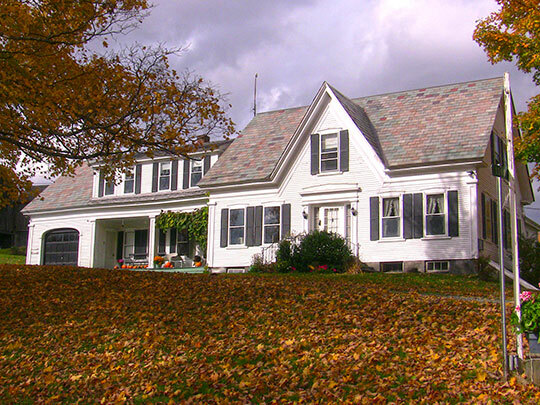 Woodstock Town Hall is located at #2 The Green, Woodstock, VT 05091; phone: 802-457-3456. Photo: Fletcher-Fullerton Farm, ca. 1850, 1390 Fletcher Schoolhouse Road, Woodstock, VT. Listed on the National Register of Historic Places in 2004. Photographed by User:Henry S. Magnuski (own work), 2014, [cc-by-3.0 (creativecommons.org/licenses/by/3.0)], via Wikimedia Commons, accessed April, 2016. The Town of Woodstock was established by petition in the 1760s by David Page and Jonathan Grout of Massachusetts. The first white settler of Woodstock , Timothy Knox, arrived in the area around 1750. Six years later, his was one of ten families numbering forty-two people and together they set out the Village Green. They chose a triangular form for community pasturage. The Town of Woodstock was chartered in 1761 and by the start of the 19th century it had become the shire town of Windsor County. On November 11, 1836, the General Assembly of the State of Vermont passed an act incorporating the Village of Woodstock. Businesses sprang up as settlers arrived. There were a wide variety of stores and proprietors to own each in the Village: grocery and clothing stores, gunsmiths, silversmiths, glove makers, a brick maker, cabinetmakers, printers, manufacturers of musical instruments and a piano factory. But there was always a strong mix of residences and commercial establishments. Woodstock eventually became one of the leading publishing and legal centers of the State. There was a Woodstock Railroad, running regularly from Woodstock to White River Junction, carrying visitors and delicacies, livestock and staples to and from the big cities. In the 21st century, Woodstock remains a small residential and commercial community, with tourism and hospitality as its two major industries. Its village and hamlets, and surrounding rural landscape, provide varied recreational opportunities and a superior quality of life for its inhabitants and visitors. Town and Village of Woodstock, Vermont, Comprehensive Plan, 2014, townofwoodstoc.org, accessed April, 2016.